Jeanette "Kay" (Atkins) Rhoten was born on February 15, 1940 in Milton, Iowa to William "Pete" Atkins and Wilma (Russell) Atkins. She joined an older sister Shirley who was 12 years her senior. Kay graduated from Milton High School in 1957 and moved to Des Moines where she joined Northwestern Bell Telephone and worked until she met and married John R. Rhoten of Adel in 1961. The couple initially lived in the Adel area until settling in Linden in the late sixties. Together they had 5 children; Johnny, Julie, Jeanne, Joanie and Jay. Kay was a stay at home mom while working part time at the Linden Elevator managing the books. She spent much of her time raising five active kids where she supported them through all their activities, and rarely, if ever, missed an event. When her first two grandchildren were born, she kept them during the day until she returned to work full time in the early 90’s at US West/Dex, adding to her time of service at Northwestern Bell. Kay worked for 15 years before retiring. Upon her retirement, Kay spent a lot of time with her children, grandchildren, and friends. She loved to keep up with her grandchildren’s activities, play card games with friends, and was an avid Iowa Hawkeye Basketball fan. In October of 2016, Kay moved to Legacy Point Assisted Living in Waukee and lived there until she passed away at home on November 13, 2018. She is preceded in death by her mother, Wilma, her father, Pete, her sister, Shirley, and her daughter, Jeanne. She leaves behind her children, Johnny (Renee) of Linden; Julie (Chris) Nelson of Overland Park, Kansas; Joanie (Bill) Bond of Earlham; Jay (Lexi) Rhoten of Pella. Kay was much loved by her grandkids, Zach, Dallas, Jordan, Cole, Libbie, Connor, Jailey, Cassie, Trey, Rylan, Natalie, Delaney, Skye, Sienna, Sibley & Lawson. Funeral Services will be 10:30 A.M., Monday, November 19, 2018 at the Twigg Funeral Home, Panora. Burial will be in the West Linn Cemetery, rural Linden. Visitation will be Sunday, November 18, 2018 from 5-7 P.M. at the funeral home. 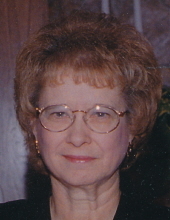 To send flowers or a remembrance gift to the family of Jeanette Kay Rhoten, please visit our Tribute Store. "Email Address" would like to share the life celebration of Jeanette Kay Rhoten. Click on the "link" to go to share a favorite memory or leave a condolence message for the family.